At a recent show, I was approached by a shopper who was somewhat bewildered after noticing that there were cane rods offered for sale at vastly different prices. Essentially, he wanted to know what separates an $800 cane rod from one selling for much more. I wish I could have offered a quick and pithy response, but the reality is the answer can be very complex. First, he noticed there are vintage cane rods by the past masters that sometimes fetch almost unbelievable prices. In my opinion, this can lead people to believe that all vintage cane rods are worth a lot of money or that collectible rod prices are in and among themselves a reflection of quality. This is not always true because vintage rod prices are based to some degree upon the relative rarity of a particular maker's work and not strictly on quality. Like artwork, prices demanded for a rodbuilder's work can climb steeply upon their death. Too bad they are not around to see the windfall. Leaving aside the work of makers not fortunate enough to still be with us, that leads us to discuss contemporary builders. In general, prices for rods reflect the old adage: There's no such thing as a free lunch. In most cases what you are paying for is the sum total of the maker's skill, experience, time and materials. From time to time you may be able to find a maker's work that is vastly underpriced considering the above factors, as well as some that might be considered overpriced given these guidelines. Generally the makers who have been at it the longest and who have trained for years to reach the pinnacle of the craft, price their work accordingly and justifiably so. Even the highest priced of these rods still represent an extraordinary value given the amount of time it takes to make a fine rod, the cost of materials and maintaining a shop, and the years of experience invested in dedication to the craft. As an aside, some part time builders can and do produce good work. Their pricing philosophy may reflect the fact that building rods can be an enjoyable way to spend their free time. Because they may not be subject to the same economic pressures that a full time builder has, they may be able to set their prices a bit lower. On the other hand, experience is gained by doing the work over and over again on a regular basis with an eye toward constant improvement. Practice makes perfect. Many people who believe that cane rod prices are too high have no comprehension of the costs associated with building rods as a profession. In addition, people may have a mental picture of the cane rodbuilder as a lone craftsman, laboring quietly in their shop and living the life of a solitary artisan. The reality is that rodbuilding is subject to all the economic laws of any business. It is just as likely when visiting a rodbuilder to find them attending to mundane chores or filling out tax forms then working at the bench. Few fishermen realize that 10% of the wholesale cost of any piece of their fishing equipment goes directly to the Federal government. This excise tax is collected and reallocated back to the states for conservation. In addition there are all the other typical taxes: Federal, State and Local Income taxes; Federal and State Unemployment taxes; Corporate Income taxes; Social Security and Medicare taxes; State Worker's Compensation taxes; Personal Property taxes; and State Sales taxes. When one takes into account all of the other costs associated with running a rodbuilding business(advertising, materials and equipment, shop overhead, etc.) it is a wonder that contemporary cane rodbuilders even exist! Cane rodbuilders who have survived these economic realities have not only paid their share of taxes, they have paid their dues. Time and materials are money! It is simply not possible to make a high quality rod cheaply or quickly. Notice that I didn't say that a functional cane fishing tool can not be made at a reasonable price. Many people are of the school that a fishing rod is a fishing rod, and they get no argument from me. After all, before cane rods became elevated into an art form, they were first and foremost a tool to fish with. Painstaking attention to details and careful workmanship takes time. And time is money. Our philosophy is this: if we are going to spend forty or more hours of our lives building a rod, why not do the best we can with the finest materials we can find? We believe this guiding philosophy helps us to build an outstanding product. Following are some small photos and descriptions of our Signature Series rods and the materials that go into them. As we mentioned, attention to details and the use of premium materials take extra time,effort and money but are the hallmarks of good craftsmanship. This is a screwlock reelseat made by Bob Venneri of New York. We use Bob's screwlock seats for a number of reasons, but foremost is the incredible attention that he has paid to the finer points of crafting his components. The wood filler is a beautiful piece of stabilized maple burl and the metal components are nickel silver. The use of a screwlock seat is a bit more expensive, but provides the customer with a secure mechanism for holding the reel. Below is a detail photo of the quality of the metalwork. The endcap has a wonderful domed profile. The slide band, retaining ring and end cap are very finely knurled and the metal is buffed to a brilliant luster removing all traces of toolmarks. The mortise in the wood spacer is generously deep allowing for the use of both contemporary reels as well as classics with thicker feet. Moving up the rod, a few words about the grip. We use only the finest cork obtainable for our grips. As of this writing, extra select cork rings run about 88 cents per 1/2" ring with a minimum order of 1,000 rings. We order our rings months in advance and stock up when the year's harvests are of exceptional quality. Above the grip we use a finely knurled nickel silver winding check to harmonize with the knurling on the reelseat and an exclusive handmade sterling silver ropebraid hookkeeper. Our wraps are of very fine silk with delicate black tipping to compliment the color of the cane. The use of fine silk takes additional time, and tipping is an embellishment for which some makers charge an additional fee. As you can see, we flame our cane to a rich brown color. The cane strips are split and straightened by hand before milling and final planing. The node spacing is 3x3, and identical node spacing (mirror matching) of the tips is standard. The blanks are glued with waterproof glue and heat cured. All of our Signature Series rods are signed and marked with the model number and recommended line weight(s). In addition, each rod is individually numbered and registered in our record books. We finish our rods with multiple coats of high gloss marine spar varnish. The slight amber color of the varnish gives a look of warmth and depth. 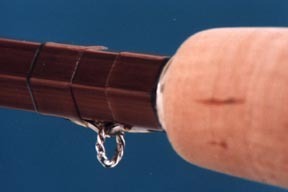 Author Ed Engle said this about our finish in the Winter 1998 issue of the Anglers Journal: "The first thing you notice when you uncase one of Jeff Wagner's rods is the finish. The varnish is exquisite. It gives the cane a depth and clarity that is unusual even in this day of increasingly finely crafted and finished bamboo rods." The next image is a detail photo of the stripping guide we use on our rods. These guides are made one at a time by Darryl Whitehead and are akin to jewelry. Agate is a very hard natural substance that is ideal for use as a stripping guide ring. The colors of the stone vary, making each one uniquely beautiful. The frames are made from nickel silver polished to a high luster. Finally, the photo below shows the type of ferrules and guides used on our Signature Series rods. We use Super-Z style ferrules by Classic Sporting Enterprises. Notice that the wrap at the ferrule is in black silk, and the transition from the shaft to the ferrule is smooth and clean. The ferrules are lapped to provide a satisfying "pop" when the sections are disassembled. The guides are hard chrome and the feet are tapered to provide a smooth transition to the rod, although we can and do use black guides and blued ferrules upon request at no additional charge. We are very proud of our work and the reputation we have carefully nurtured over the years for quality and integrity. Unlike the many that come and go with each new fad, we're in this business for the long haul because we love our work and the many friendships we've made over the years. 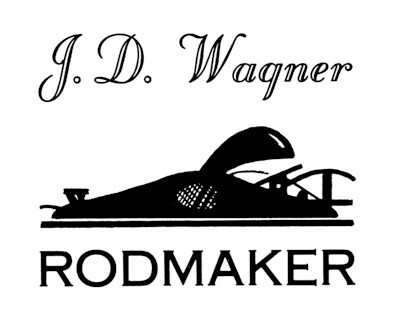 We stand behind the quality of our work with our Guarantee: Every Wagner rod is guaranteed against defects in materials and workmanship to the original owner for life. We deliver when promised and stand behind what we make and sell. Copyright 2000, 2001, 2002, 2003,2004,2005, 2006 J.D. Wagner, Inc.